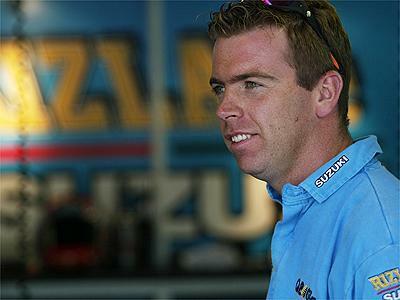 Current Crescent Suzuki boss Paul Denning will become the team manager for the factory Suzuki MotoGP team in 2005. Denning replaces current manager Garry Taylor, who steps down after almost 30 years with the factory GP team. Taylor is the most experienced and longest serving team manager in the GP paddock, first working with Suzuki when Barry Sheene won two consecutive 500cc titles in the mid 1970s, and also taking Kevin Schwantz and Kenny Roberts Jnr to world championships in 1993 and 2000. "I had always planned to step down at 55 and to take a less active role," said Taylor. "I'm spending more and more time on the road. Next year's schedule would have meant more than 200 days away. I have an eight-year-old daughter, and I have never been home for her birthday, or indeed for any of my wife's birthdays." "Secondly my health has been deteriorating, and while there is nothing that can't be fixed, I need to be able to give the doctoers the time they need." His successor, Paul Denning, has taken Crescent Suzuki rider John Reynolds to the 2004 British Superbike title, and the team will defend their position in 2005, in addition to Denning's new commitment to the MotoGP squad. Current Crecent British Superbike rider Yukio Kagayama stepped into the factory squad for the last round at Qatar, finishing 11th.